Just posting a few images from my impending talk at SVPCA this Thursday. 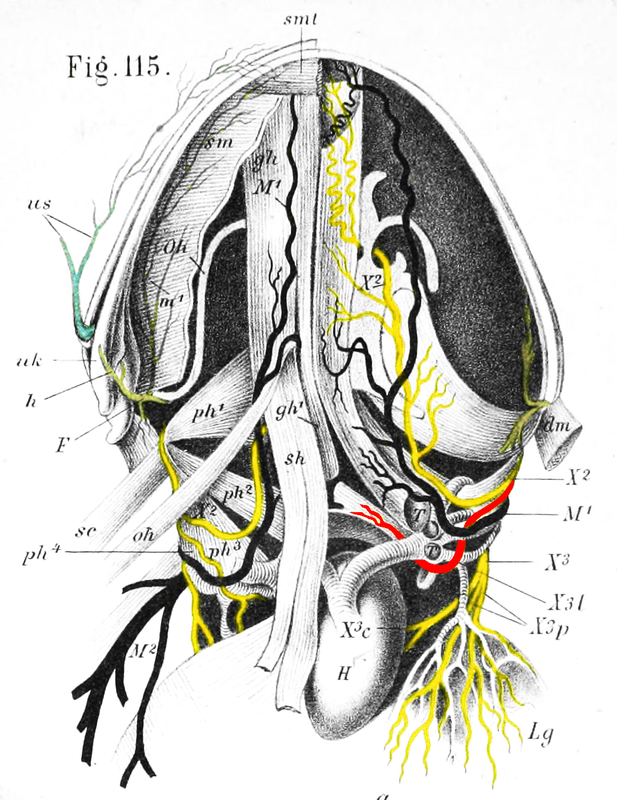 I’ve written about the recurrent laryngeal nerve before, in Wedel (2012) and in this post. It’s present in all tetrapods, from frogs and salamanders on up. The frog RLN is shown in ventral view above, and in lateral view below, both from Ecker (1889:plate 1, figures 114 and 115). I’ve highlighted the RLN in red in both. Perhaps not a monument of inefficiency, but still recurrent, and therefore dumb. 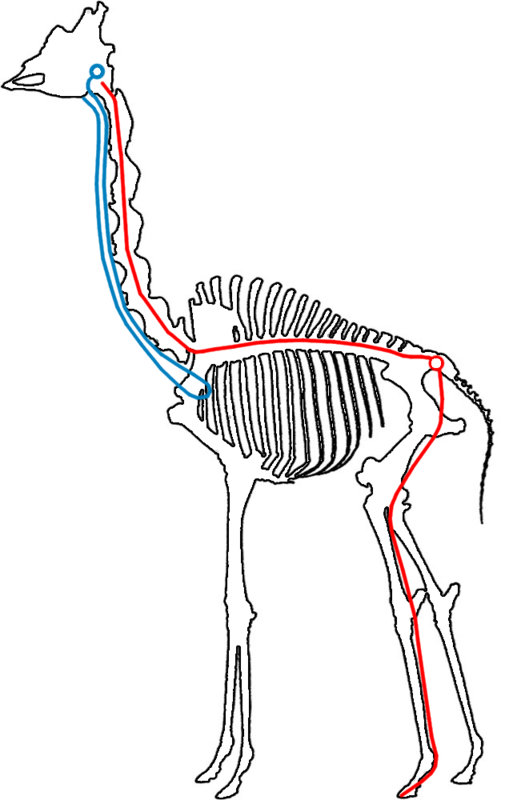 And in a giraffe – RLN in blue, nerve path to hindfoot phalanges in red. Hollow circles are nerve cell bodies, solid lines are axons. And in the elasmosaur Hydrotherosaurus, same color scheme plus the nerve path to the tail in purple, base image from Welles (1943). Ecker, A. 1889. The Anatomy of the Frog. 478pp. Clarendon Press, Oxford. Wedel, M. J. 2012. A monument of inefficiency: The presumed course of the recurrent laryngeal nerve in sauropod dinosaurs. Acta Palaeontologica Polonica 57 (2): 251–256. Welles, S. P. 1943. Elasmosaurid plesiosaurs with descriptions of new material from California and Colorado. Memoirs of the University of California Museum of Paleontology 13: 125-254. I’m interested in this oddity of anatomy! I saw it discused on ‘Dissecting Nature’s Giants’ (the giraffe). Am I correct in assuming that any description of these nerves’ paths re elasmosaurs (and sauropods, or any other extinct animals) is solely by inference from extant species, which have a long-way-round topology in common? I’d also be interested to know of any biological consequences. I infer a delay occurs in nerve transmission, proportional to path length (or as, maybe, further modified by any increased myelination, increased fibre diameter etc) – does the delay impinge significantly on function, and what may be the disadvantages or advantages of this for the organism, given the known or presumed role of this innervation in various animals? I’m curious! “Path of the Recurrent Laryngeal Nerve” sounds like an obscure kung fu school. Sorry, I have nothing intelligent to contribute. Thanks, folks, for the comments. Sorry it’s taken me a while to get to them. armadillozenith, you are correct that the path of the RLNs in extinct animals is inferred rather than observed. But as inferences go, it’s pretty darned strong. See this post for more on that. As for biological consequences of such long nerves, see Wedel (2012) – linked on the sidebar – and this post. Brad, I hear you, but in this case it does seem to be a genuine inefficiency that the body has to work to overcome. The recurrent path doesn’t seem to be doing any work just by being recurrent, because the right recurrent laryngeal nerve is occasionally non-recurrent (for reasons explained in the first post linked above), and people with that condition do not appear to suffer any ill effects from the nerve’s variant course. They occasionally have trouble swallowing because the big arteries in the chest are replumbed and put pressure on the esophagus, but that’s a separate phenomenon. And we know that the body has to compensate for the long path of the RLN by myelinating the fibers more heavily to speed up nerve conduction and maintain muscular coordination in the larynx. In fact, the fibers of the left RLN, which has to travel about 10cm farther than the right RLN in humans (and 30cm farther in giraffes), are measurably thicker, as demonstrated by Harrison (1981). Presumably nerve impulses in the left and right RLNs leave the brainstem at the same time, those in the left RLN have farther to go but also travel faster because of the heavier myelination, and both sets of signals (left and right) arrive at the larynx at the same time. Nathan, your contribution is noted and appreciated. May peace be upon your paleoanatomical explorations. Harrison, D.F.N., 1981. Fibre size frequency in the recurrent laryngeal nerves of man and giraffe. Acta Otolaryngologica, 91: 383-389. Irrelevant to this post but possibly of interest: the Federal Trade Commission has sued OMICS Group, Inc., an India-based academic publisher. Good for the FTC! OMICS are well-known scam-merchants. I have no sympathy with them at all.